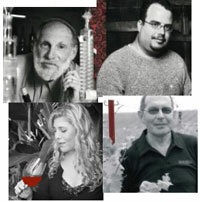 Ed Salzburg - Chief Winemaker, hails from the USA, where he studied his profession at the University of California Davis. He gained his practical experience working in wineries in California and in the New York Finger Lake district. Yotam Sharon - was born in Jerusalem. From a young age, Yotam was attracted by the world of wines, investigating it in every possible way - reading, tasting and collecting wines. After his military service, Yotam decided to become a winemaker and, supported by his family, traveled to Montpellier. He had earned two viticulture & Oenology degrees, including France's Dipl�me National d'OEnologue, graduating as first in class. He worked as an intern at Ch�teau Mouton-Rothschild and in the Roussillon region. Yotam joined Barkan in 1999 and has been instrumental in the building of the new Hulda winery.His passion for wine, combined with his proven scientific skills and commitment to excellence, promise wine lovers loads of pleasure from Barkan wines. Irit Boxer-Shank - was born in Israel as a sixth generation to agriculturists and viticulturists. From a young age exposed to grape growing and to the wine industry and fell in love with winemaking. Therefore, after graduating from the Faculty of Agriculture at the Hebrew University in Jerusalem with a B.sc. degree, decided to go out to the new world of wine and do her Master in Oenology at The Adelaide University in South Australia. Today, she is the recent addition to Barkan winemakers' team. Yossi Greenfeld - Comes from Argentina, where he managed a large family wi nery after obtaining a masters degree from Mendoza University. Yossi started working at "Stock" and today he is in charge of the production of brandies, vodka, and liqueurs.